Most of you probably know Bob. He is head of security here at the ranch. As things are counted by human events and chronology I suppose Bob is now six years old. The counselor at the high school saw him peeking out from a car tire when she was driving to work. The tire was laying by the side of the road on Community drive in New Caney, Tx. He was too small to get out. She brought him into school and asked who would take him. Somebody beat me to the punch and took him home. They had a two year old grandchild and Bob couldn't have been more than six weeks old. Had to admit it was a better thing for a puppy than roaming a small (5 acre) ranch. Well they just don’t make two year olds like they used to or Bob was too rambunctious at six weeks old. Hard for me to imagine but their loss was our gain. She called me and I called Sally and told her to come get him. She did and we have all lived happily ever after. Well...except for that swimming pool that got chewed up, and the time he ate all the treats, or when he was incessantly compelled to chase our sheep, or when he would jump up on Rosa and the girls when they were dressed for church, and...well never mind. There have been a few bumps in the road trying to get a farm dog used to semi-urban living. It's turning out okay though because we needed a sheriff and now the ranch is his. After the incident with the snake http://www.grangerlandrfd.com/dont-mess-with-mama-duck, we have been gradually expanding his freedom and he has responded by protecting virtually everything within our fences. He has also become quite proficient at herding ducks and, of course, the donkeys and llama. That last one presents a small problem as the donkeys and llama don’t want to be protected or herded. They had him cornered under a trailer just last week but Bob is quick enough to make them all look like fools. I don’t think he can outrun the llama in a footrace but he sizes things up pretty quickly and is better at broken field running. We don't believe in reincarnation here at the ranch. At least I think we don't. However, there is something here that I find strange. I've been here before. The first time started about 1943 or 1944. My parents told me that I was a few months old and laying on a blanket under the shade of a tree. I was with my older sister (second mom/live in babysitter) when my brother dropped a puppy on the blanket. My sister was startled and let out a scream. The puppy (his name was Andy) and I both started crying together or so the story goes. We became inseparable for the next 13 years. I remember that he became stiff and sore before the end and when he finally died he could hardly walk. I freely confess that I cried like a baby when he died. Never knew he would be back but except for the tail they are the same dog. We did not have the internet when Andy and I were young. Thanks to Google, I now understand that these two dogs are/were at least part Australian Shepherds. In Andy's case it was before it was cool. Aussies are farm/stock dogs from an area ranging from Montana/Wyoming down through the middle of the country. They were called Australian Shepherds because of the human Australian Shepherds who used them to herd the sheep. Australian shepherds are not from Australia and bark with North American accents. This is not the black gene Aussie. It is a black and tan. If there is any white fur she is a tricolor. A black gene will have black or white paws and will probably have a white breast. I suspect that Andy and Bob are or were mixes. However, I am convinced they come from exactly the same stock as this breed. There are also some with coats that are somewhat dappled (called merles). Frankly there are some very beautiful dogs with baffling appearances. Most that I have seen have been at least tricolor and if the light is just right you can see patches of brown in Bob. Google them for an adventure in color. By the way, this is not just me. Every vet that has seen Bob records him an Australian Shepherd or an Aussie mix. Both Andy and Bob owned their respective neighborhoods. Our other dog Indy is afraid of no dog it seems but other things do bother Indy, that Bob won't tolerate. Our son-in-law has a cat named Stubby (bobtailed like Bob). Indy will not approach that cat as he understands all about the spit and the claws that he wants to. I don’t think Bob knows the cat exists. At least he does not acknowledge him. This link: http://www.grangerlandrfd.com/the-odd-couple is about Indy and his troublesome relationship with Mr. Goose. The stupid thing is that one thing in our house does intimidate Bob. The air conditioning ducts in our floor. He skirts them like they will bite. Hopefully he will now be that way with cars. Ok, turn off the twilight zone music and we will get back to Bob and his condition. This is where I am accustomed to finding him. He seems to either think this is his throne or he just feels really comfortable in this position. Once he became free of the tether he began to dine wherever he wanted. When I put this heavy ceramic dish down for him to eat, who knew where it would go next. Actually right now I do know. He put it on the other side of the house. He seems to see things just the way he wants to and he was always on the go at a pretty fast pace. Bob did slow down. Yesterday was the culmination of several days that were not so good. Bob was a big reason we bought a Toyota 4Runner. He frequently slobbered on me when I took him places in the truck. Now if I want to be slobbered on Bob will be second in line. I just haven't felt the urge. He hops up into the back seat of the 4Runner now and we both have our space. Recently there has been a small problem. For the past couple weeks with the seat back laying down he has been unable to get in without help. His running mate Indy has also been a little bit stiff. I did due diligence and found I could buy some “old timers” dog food with glucosamine and chrondroiton. I figured the boys were worth the extra expense. I bought a bag and if we have to we are prepared to mix the same witches brew that we did for our first Rott. Hope it doesn’t get that far. It is a mix we got from Heidelberg kennels. They raise German Shepherds and claim to never have problems with hip dysplasia. Along with this inability to pretend to be young was his severe need of a haircut. He began to get knots in his coat that could not be brushed out. Normally we get a haircut for him each spring. His aunt Lettie has gone to Florida and his cousin Zach is working to climb the management ladder for PetSmart. I did not want to bother him and it quickly got out of control. This picture is Zach and Megan giving him his haircut last summer with Sally using her computer/phone. The haircut came out good. I don't know if this was a Zack or a Lettie job. I do know that he was nearly shaved and I got compliments on his appearance every time I took him to the park. With this haircut in May he would be completely grown out in time for the winter in October. He always looked good and if he went to the park in the winter he looked like a bear. I've heard that comment a lot from kids. There is always something to use for an answer. One kid is now convinced he knows what a wolverine looks like. His dad may have told him the difference but seemed unable to speak at the time. This plastic grocery bag full of hair is about half of what I took from him. I dulled a set of scissors and an electric hair clipper/trimmer. He had enough nonsense by that time (me too). Even though I wasn’t finished I stopped for the day as he told me quite forcefully that he was not pleased. He did accept the bath. When I was doing this I was reminded of the homeowners who tried to do jobs I had bid to them as a chimney sweep. It's hard to duplicate a pro. I knew I needed to do it again as there were more snarls on his hindquarters. Thought I would give it a couple days to build up courage for both of us. At least he had finally had a bath. Yesterday morning when I was out feeding the stock Bob saw a strange dog come across our property. Forgetting that he was supposed to be getting old, Bob took off chasing the dog. Now this is Tommy Smith Road. At no point is it overgrown and at no point is a vehicle visually shielded from activity by the side of the road. I had a house between us and could not witness it but I heard him cry and no sound of brakes. The drivers life has been saved by the fact I did not see him and have no license tag to trace. I rushed to the street and did not find Bob. I went inside and told Sally what I knew and that I was waiting to see if he showed up again. He did not make his presence known to us over a two hour period. I went outside and called him. He came limping out from under the house. There was blood on his left rear leg and it had a slightly awkward angle. We took him to Conroe Veterinary clinic and I do not hesitate a moment to recommend them. They cared for him very well and I did not have to take out a second mortgage on the house to do it. Funny thing about some people and about some dogs. You can half kill them and they won't complain. This is after Bob went to the vet. I know that because the vet put him under anesthesia, x-rayed him, found a dislocation of the head of the femur, reduced the dislocation, and sutured a wound. 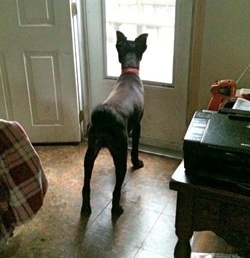 Since I had assured her that the bald spots were not mange and had, in fact, been done by his loving and skillful owner, she shaved the other clumps before she did the suturing. She was going to explain his hip dysplasia to us but found we already knew.The shaved patches on his leg are from her. The ones on his flank probably are from me. What's the difference between a good haircut and a bad one? The answer is 2 weeks. (Not really if you're listening Lettie or Zach.) What is going to happen, however, is that the shaved patches will disappear. Have to trim the long stuff before that happens. Another look. This was his favorite place the first day (yesterday) but he has attempted to beguile me into letting him loose today. If I still have clippers I will have to get that belly. They may be too dull and I'm not sure I want to have $20 clippers sharpened. An expanded view shows some of our frustration. We bought a bed for his use but can't seem to get him to use it. Frustration aside, I think we are lucky he didn't get killed trying to herd that car. He will be back being a pain and an appreciated employee before we know it. I think the signs of slowdown will probably increase and that's ok. A puppy has far more energy than I do. Bob is probably going to be an excellent match for his human. We got him to use the bed with the strategy of my dog whisperer genius wife. She put a treat in the middle of it and I petted him when he got in. He stayed. She also figured out how to get him to take his medicine. The vet couldn't and it isn't her fault. Bob is as headstrong as his human. Sally just wrapped it in bacon and Bob did not hesitate a second. Pretty smart. I won't say I like dogs better than people but Bob is pretty special.